Lake Eufaula, Impounded in 1963, has produced some of Alabama’s biggest largemouth bass. Spring bass fishing on this lower Alabama Impoundment is, as they say, as good as it gets. A rather shallow lake (although water depths of over 50 feet do exist on the lower lake) and a lake loaded with a variety of cover. Wood cover, all types of aquatic weeds and plenty of rocks, both natural rocks and boulders and man made rip-rap rocks that line dozens of bridges and the dam area, which is over one mile wide. All that feature bass year round. Whenever you fish Lake Eufaula during the month of March, use extreme caution when navigating, especially when venturing your boat just out of the main river channel. There are a lot of areas on Lake Eufaula, both on the main lake and up in its many feeder creeks, where deep water of 20-30 feet is sitting right next to stump rows in 1-2 feet of shallow water. Places, where anxious springtime anglers often forget, they are not running their high powered bass boats in normal, full pool lake levels…until its to late. Boat and motor damage are at risk and lives are at stake, so use extreme caution! * Lake Eufaula will be returned to full pool in April. 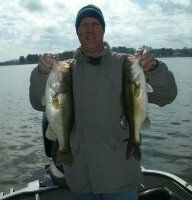 As for the fishing in March, its pre-spawn time when some of the year’s biggest bass are moving up into some very shallow water. This is the best time of the entire year to connect with one (or more), of Lake Eufaula’s true, trophy-sized largemouth bass. Bass in the “teens” have been fooled in years past on this massive southern impoundment, usually by some fortunate angler and often very lucky enough angler, to have fooled such an adversary. 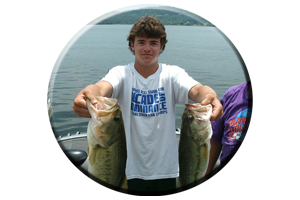 During the prespawn month of March an angler can encounter the biggest bass of a lifetime. So be prepared with stought tackle, good dependable line and strong rods and reels! Knowing where to be, at just the right time, can show an astute angler often excel over others. Warming waters can have bass preparing early spring season beds by early to late March, some bass even attempting to bed earlier. Its all according to the weather. Lake Eufaula is located in the southeast portion of Alabama. This rather long lake of 87 miles in length, sits right on the Alabama / Georgia state line. Lake Eufaula is a wide open generally shallow water, southern impoundment featuring 45,181 surface acres of water. It is in a region where a lot of southern sunshine can warm the lake’s shallow, stained waters real fast during the early part of the spring season in March. Having a water temperature gauge on your boat, will pay for itself fast, while aiding you in finding those small little hot spots other anglers overlook. Northeast pockets are the first places to warm in the spring. 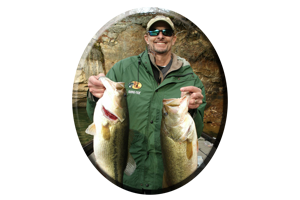 These quick-to-warm places, are often hidden in Lake Eufaula’s shallow backwaters, places that hold those early season, really big, trophy-sized largemouth bass. Also places that always show these big bass move up at the first full moon, when coupled with the right conditions. Big, early season trophy-sized bass, those rare breed exceeding ten pounds, have been noted bedding much earlier than Lakes Eufaula’s smaller bass. In the past, usually during the mid-to-late March period, around a full moon, in water temps as cool as 60-65 degrees, they can be seen bedding or preparing beds early in the spring season. But usually these largemouth bass are more concentrated in the shallows when weather conditions stabilize and water temperatures reach 72 degrees, the perfect bedding water temperature for largemouth bass. Lake Eufaula, like other southern impoundments, can be severely affected by cold fronts that often hit the lake off and on throughout the month of March. So be prepared and fish a little deeper and a little slower until prespawn bass return to the shallows as conditions get better in April. April is when the lake is invaded by hordes of hopeful bass anglers, and this month shows the beginning of much more stable weather conditions. This keeps the hordes of bass anglers away during the month of March. Those anglers that would rather plan a trip to this world-famous lake when better weather is evident and more stable conditions, makes for a much more fun trip! By April the lake goes through some major changes. This rising water in April can suddenly cover acres and acres of newly flooded shallow water, often taking place in just a few days. When all of this newly flooded cover is suddenly underwater, its not long before in move the bass…including the many meals they dine on. These are still pre-spawn bass exploring the newly flooded shallows looking for prime bedding territory. Both male and female bass that set up house and begin the ritual of re-producing another years offspring. Eufaula’s bass can even be seen bedding in late April and some late spawners have been seen bedding in early May. Newly growing aquatic weeds, stumps, brush piles, laying logs and laying trees, natural rocks and boulders and man made rip-rap rocks found around bridges, causes ways and the dam area, suddenly become flooded as well in April as the lakes waters rise. Man made piers and boat houses, some that have been high and dry all winter, suddenly become shade-producing homes for April’s early spring season bass. These man made bass structures will be good for numbers of bass from April until October, when the lake is again lowered for winter pool. By now you’ve heard it. Yes, May is topwater time! 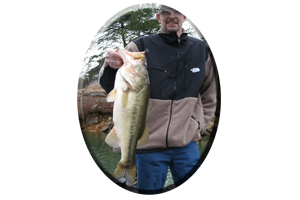 Lake Eufaula can produce numbers of big hungry, shallow water bass, all during the entire month of May and often all throughout the month of June as well. But deep water anglers should keep in mind. When everyone appears to be to be beating the shallows with a variety of offerings, there are bass deep. 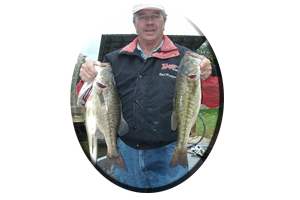 These are often big bass that have bedded early in the spring season, bass that are now slowly moving back to deeper water. The term, “Deep water” on Lake Eufaula can be water only 5 feet deep. When the lake is at full pool in May, this means there are plenty of areas to probe your lures, where sudden deep water drop-offs are nearby. These are post-spawn travel routes, the same places these big, female bass traveled into the shallows during the pre-spawn season. 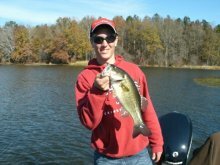 Places that these big post-spawn bass use to return to the lakes deeper water for summer. Places usually found, where these post spawn bass are sitting right under the boat of the bank-beating angler! From March into May, some bass are in shallow water and some bass are in deep water as well on Lake Eufaula. Bring plenty of rods rigged with a variety of lures, for both shallow water and deep water applications. 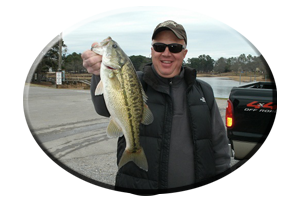 Including loads of weedless lures for fishing Eufaula’s varied, weedy shallows. My advice? Leave the light tackle stuff at home, that is unless your after bream or crappie. Bring a camera your gonna need it! 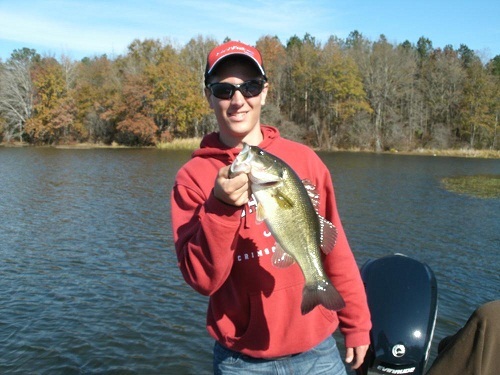 Please Practice C P R – Catch, Photo and Release this spring season on all of Alabama’s Lakes!